Idon, Paul I. / Esan, Temitope A. / Bamise, Cornelius T.
Purpose: This study assessed the comparative efficacy of three in-office treatment agents in patients presenting with dentin hypersensitivity (DH) at a university teaching hospital. Materials and Methods: A randomised, controlled study was conducted to compare the efficacy of Gluma desensitiser, Pro-Relief and Copal F in relieving the pain of DH. In 68 subjects with 508 hypersensitive teeth, the agents and placebo (distilled water) were applied to 127 hypersensitive teeth each. At baseline, the pain of DH to tactile and evaporative stimuli was measured using the visual analogue scale (VAS) and verbal rating scale (VRS). Post-application assessment was carried out at 10 min, 1 week, 2 and 4 weeks. Results: The mean difference in VAS between baseline and post-treatment periods significantly increased for all the desensitising agents (p < 0.05) with both tactile and air-blast stimuli, except for the placebo. Gluma desensitiser had the highest mean difference at 10 min (3.7 ± 1.8) and 4 weeks (5.4 ± 2.3) for tactile and air-blast stimuli, respectively. However, using the VAS, no statistical significance was noted in the mean differences between the agents. With the application of Gluma desensitiser, a significantly higher number of teeth had no pain at 4 weeks using the VRS. Conclusion: Gluma desensitiser can be suggested as an appropriate desensitising agent for in-office treatment of DH. Purpose: To summarise the evidence for the efficacy of oral health educational programmes provided to expectant mothers for preventing Early Childhood Caries (ECC) and to determine the most effective intervention programme. Materials and Methods: The search strategy included clinical trials in the Cochrane Oral Health Group's Trials Register, PubMed, Science Direct, Google Scholar, LILACS and ClinicalKey (up to 26 August 2013) in English. Reference lists of identified randomised controlled trials (RCTs) and review articles were also hand searched. Studies were selected according to predefined inclusion and exclusion criteria. Results: The search identified 392 studies, only four of which were included. Risk ratios (RR) were calculated. The quality of the evidence was assessed by the GRADE approach. Results showed statistically significant decreases in caries incidence (RR = 0.18, 95% CI [from 0.06 to 0.52]) in one study. Meta-analysis could not be performed. Conclusion: Oral health educational programmes for expectant mothers may have a positive impact in preventing ECC, although the evidence is weak. Purpose: Crohn's disease (CD) is a chronic inflammatory bowel disease characterised by localised areas of nonspecific, noncaseating granulomas. Approximately 1/3 of CD patients develop extraintestinal manifestations in the course of their disease. This review focuses on oral manifestations of CD to understand if oral lesions could help clinicians in the diagnosis of systemic CD. Materials and Methods: Literature for the review was retrieved using PubMed Medline, Ebsco Library and Web of Science. Results: After a careful preliminary evaluation, only 43 articles were eligible for inclusion in the qualitative evaluation, whereas only 7 mentioned oral CD as the first sign of a systemic disease and were included in the quantitative evaluation. Conclusions: Oral manifestations of CD can be classified as specific and non-specific. The aetiology of oral CD seems to be linked to particular bacterial infections. Although the evidence from the literature is weak, it seems that in some cases the inspection of the mouth could assist in the diagnosis of a systemic Crohn's disease. Inglehart, Marita Rohr / Zuzo, Gabrielle A. / Wilson, Joshua J. Purpose: The percentage of U.S. children with poor oral health continues to be high. Kindergarten/elementary school educators could play an important role in teaching students about oral health promotion. The objectives were to assess which oral health-related web-based resources teachers consider most helpful and how teachers' attitudes, knowledge, and behavioural intentions concerning oral health-related teaching change between before and after having access to a resource website. Materials and Methods: Web-based survey data were collected from 95 kindergarten/elementary school educators before and after they accessed a website with oral health-related information for teachers (web-link: http://media.dent.umich.edu/teachoralhealth/index.html). Results: Most teachers accessed lesson plans about 'Teeth and smiling' (90%) and 'Taking care of your teeth' (88%) and the fewest accessed information about 'Nutrition and health' (42%) and 'Information for parents' (39%). On average, all materials were perceived as useful (5-point scale with 5 = 'very useful', range = 3.80 to 4.04). Responses to the question on how important dental health is for a child's ability to learn improved significantly from before to after the educational intervention (5-point scale with 5 = 'very important', 3.78 vs 4.44). Knowledge increased and behavioural intentions improved as well. The percentage of teachers who reported that they had included oral health-related material in the past was 47% and the percentage who intended to include it in the future was 65% (p < 0.001). Conclusions: Providing kindergarten/elementary school educators with web-based resource materials improves their attitudes, increases their knowledge and leads to positive behavioural intentions concerning educating their students about oral health. 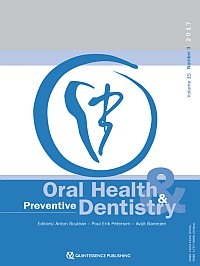 Purpose: To assess the changes in oral health-related quality of life (OHRQoL) and satisfaction among older adults after receiving new complete dentures, and the association of age, gender, education, medical history, past prosthetic history (number of previous complete dentures and time since current complete dentures) and quality of existing complete dentures with patients' ratings of satisfaction with their complete dentures. Materials and Methods: The study comprised 114 community-dwelling adults ? 65 year of age, all wearing complete dentures in both jaws. The sample was selected from four senior day centres. Data were collected using clinical oral examinations and a self-administered questionnaire. Dentures were clinically evaluated for retention, stability, occlusion, articulation and vertical dimension. The questionnaire recorded data on sociodemographic information, previous denture history, oral satisfaction scale (OSS), and OHRQoL through the Oral Impacts on Daily Performance (OIDP) scale. Results: There was a significant improvement in OHRQoL after treatment (mean OIDP score: 2.7) compared to before treatment (mean OIDP score: 6.6). The largest changes were in relation to impacts on eating (33.3% to 15.9%) and smiling (17.5% to 4.5%). Six months after placement of the dentures, patient satisfaction improved compared to before treatment (p < 0.001). The results of this study demonstrated that satisfaction was correlated with age, gender, and past prosthetic history in the patients rehabilitated with complete dentures. Conclusions: The provision of new dentures among older adults resulted in significantly better satisfaction and OHRQoL than wearing existing dentures. There was no significant correlation between the clinical assessment of the dentures and patients' satisfaction with them. Purpose: To evaluate the antibacterial, mechanical and biocompatibility characteristics of an orthodontic adhesive that contains quaternary ammonium polyethyleneimine (QPEI) nanoparticles. Materials and Methods: QPEI nanoparticles were added to an orthodontic adhesive at 0%, 1% and 1.5% wt/wt. Antibacterial activity was tested after aging for 14 days using the direct contact test (DCT). The degree of monomer conversion (DC) was measured using Fourier transform infrared (FTIR) spectroscopy. Shear bond atrength (SBS) was tested on the etched enamel of extracted human teeth. Biocompatibility was tested using keratinocyte and neutrophil cell lines in the XTT assay. Results: The DCT results showed significant bacterial growth inhibition in the test group incorporating 1.5% wt/wt QPEI nanoparticles (p < 0.05). The DC of the 0%, 1%, and 1.5% wt/wt samples measured immediately and after 10 min was 62.2-71.0%, 59.1-68.7%, and 52.9-58.6%, respectively, and the average SBS were 9.25 MPa, 11.57 MPa, and 9.10 MPa, respectively. Keratinocyte and neutrophil viability did not change following the addition of QPEI to the orthodontic adhesives. Conclusions: The incorporation of QPEI nanoparticles into orthodontic cement provides long-lasting antibacterial activity against Streptococcus mutans without reducing the strength of adhesion to enamel, the degree of double bond conversion during the polymerisation, or the biocompatibility of the orthodontic cement. Purpose: To test the antibacterial effects of different toothpastes with the slurry method of toothpaste application in an in vitro oral biofilm model including relevant periodontal pathogens. Materials and Methods: Four commercially available toothpastes, two containing sodium fluoride (NaF) at different concentrations (1450 and 2500 ppm), two NaF with either triclosan or stannous fluoride, and a control phosphate-buffered saline (PBS) were used. Multispecies biofilms containing 6 species of oral bacteria were grown on hydroxyapatite disks for 72 h and then exposed for 2 min to the toothpaste slurries or phosphate buffer saline (PBS) by immersion, under continuous agitation at 37°C. Biofilms were then analysed by means of real-time polymerase chain reaction (PCR), combined with propidium monoazide (PMA). Statistical evaluation was performed using ANOVA and Student's t-test, with Bonferroni correction for multiple comparisons. Results: The toothpastes containing NaF and stannous fluoride demonstrated superior antimicrobial activity for A. actinomycetencomitans, P. gingivalis and F. nucleatum when compared to those containing NaF and triclosan, 1450 ppm NaF or 2500 ppm NaF in this multispecies biofilm model. Conclusion: The proposed model for the evaluation of toothpastes in the form of slurries detected significant differences in the antimicrobial effects among the tested NaF-containing toothpastes, with the stannous fluoride-based formulation achieving better results than the other formulations. The use of toothpaste as slurries and real-time PCR with PMA is an adequate method for comparing the in vitro antimicrobial effect of different toothpastes. Purpose: Systemic immune activation has been recently linked to chronic inflammatory disorders of the oral cavity, particularly to periodontitis. The purpose of this study was to determine whether treatment of a fungus-induced oral inflammation, namely denture-related stomatitis (DRS), can affect the activation of the systemic immune response. Materials and Methods: Peripheral blood from patients with denture-related stomatitis caused by Candida albicans infection (n = 15) was collected at three time points: before treatment with nystatin, at the end of therapy and 2 months after finishing therapy. Activation of T cells and monocytes was assessed by flow cytometry. Results: The percentages of peripheral lymphocytes, T cells and their subpopulations, as well as monocytes were similar before, immediately following and two months after nystatin treatment. Cells expressing early activation marker CD69 and RANTES C-C chemokine receptor type 5 significantly increased immediately after treatment and returned to baseline levels after two months. Th17 cells, which have been implicated in the pathogenesis of DRS, remained unchanged. Central memory CD4+ subset and intermediate subset of monocytes were lower after therapy and this effect was sustained for two months. Conclusion: Treatment of denture-related stomatitis does not seem to affect the general state of the cellular components of the immune system. The results suggest a potential proinflammatory effect of the antifungal agent, nystatin. Although transient and not intense, this effect might be of particular clinical importance, because of relationships between inflammation and certain diseases. Further studies are required to clarify this aspect. Purpose: To evaluate the effect of CPP-ACPF paste and fluoride toothpastes on enamel subjected to erosion and erosion plus abrasion in vitro. Materials and Methods: A total of 220 human enamel blocks were divided into eleven groups (n = 20): CPP-ACPF paste (MPP), potassium nitrate/sodium fluoride toothpaste (PE), sodium fluoride toothpaste (FD), fluoride-free toothpaste (SO) and control (erosion only with no paste or toothpastes; CO) according to the experimental design: erosion or erosion plus abrasion immediately after erosion (ERO+I-ABR) or 30 min after erosion (ERO+30min-ABR). For 5 days, the specimens were subjected to: (1) erosive challenge (EC) (cola drink, 4 x 5 min/day), topical application of the undiluted paste or diluted toothpastes (1:2 w/w) (4 x 1 min/ day) plus 1 h in artificial saliva (AS) between cycles and overnight; or (2) EC plus abrasion (4 x /60 s/day) performed with the diluted toothpastes (no MMP) plus 1 h in AS between cycles and overnight. Erosion depth was quantified through a 3D profilometer. Data were analysed using Kruskal-Wallis, Mann-Whitney and Wilcoxon tests (p = 0.05). Results: CPP-ACPF paste and NaF toothpaste showed lowest enamel wear among groups and reduced tissue loss by 89% in erosion challenge. Abrasion led to higher enamel wear than erosion only (p = 0.030). ERO+30min-ABR had no protective effect when compared to ERO+I-ABR (p > 0.05). Conclusion: A high frequency of CPP-ACPF paste application (4x daily) is effective in reducing the effects of erosion. A waiting period before performing toothbrushing does not protect enamel against erosion regardless the composition of the toothpastes. Purpose: The aim of this study was to determine the antimicrobial effects of propolis extracted from an endemic species of stingless bee, T. sirindhornae, on the cariogenic bacterium Streptococcus mutans. Materials and Methods: Dichloromethane extracts (DME) of propolis (DMEP) were prepared and analysed by reverse-phase high-performance liquid chromatography. The antibacterial growth and antibiofilm formation effects of DMEP on S. mutans were compared with those of apigenin, a commercial propolis product. The effects of DMEP and apigenin on glucosyltransferase (gtf) B expression in S. mutans were investigated using real-time polymerase chain reaction. Chlorhexidine (CHX) was used as a positive control in the experiments. Results: Apigenin, pinocembrin, p-coumaric acid, and caffeic acid were not detected in the propolis extracts. DMEP and apigenin significantly inhibited S. mutans growth (IC50 = 43.5 and 17.36 mg/ml, respectively). DMEP and apigenin also exhibited antiadherence effects on S. mutans as shown by reduced biofilm formation. Furthermore, a significant inhibition in gtfB expression was observed in DMEP and apigenin treated S. mutans. Conclusion: Propolis produced by T. sirindhornae demonstrated antibacterial and antibiofilm effects, and reduced gtfB expression in S. mutans. The antibacterial activities of propolis observed were not due to apigenin, pinocembrin, p-coumaric acid, or caffeic acid. Purpose: To elucidate the association oral malodor with the levels of periodontopathic bacteria in saliva and tongue coating of periodontitis patients with oral malodor. Materials and Methods: In 25 periodontitis patients, the organoleptic test (OLT) was performed, the levels of volatile sulfur compounds (VSCs) were measured, tongue coating (TC) score was determined, and periodontal parameters and the proportions of Porphyromonas gingivalis, Aggregatibacter actinomycetemcomitans, Treponema denticola, Tannerella forsythia and Prevotella intermedia in the saliva and the tongue coating were evaluated. Results: The proportions of T. denticola and T. forsythia in the saliva of patients with an OLT score ? 2 were significantly higher than those with OLT scores < 2. The proportion of P. gingivalis in the saliva significantly correlated with periodontal parameters, whereas T. denticola and T. forsythia levels in the tongue coating correlated with VSC levels. However, the five periodontopathic bacteria were found in the tongue coating at levels approximately 12 times lower than in the saliva. Conclusions: The findings suggest that the levels of T. denticola and T. forsythia in the saliva of periodontitis patients correlate with oral malodor, and that the prevalence of P. gingivalis in the saliva is related to periodontitis. Periodontopathic bacteria in the tongue coating contribute minimally to oral malodor in periodontitis patients. Purpose: Tongue piercing (TP) has been gaining in popularity, mainly among adolescents and young adults, and there has been a corresponding increase in reports of dental injury and adverse effects on periodontal tissue due to TP jewellery. The purpose of this study was to assess the type and prevalence of dental injury and periodontal complications in a group of Slovenian adolescents and young adults with TP in comparison with a control group. Materials and Methods: This case-control study included 17 subjects with TP (study group) and 28 subjects without TP (control group). Subjects were clinically examined for dental injuries, as classified according to Andreasen. Periodontal complications were evaluated using an estimation of clinical attachment loss (CAL) and gingival recession (GR). Differences in categorical variables were analyzed using the chi-squared or Fisher's exact test as appropriate. Differences between the groups in numerical variables were analyzed with the Mann-Whitney U-test. A multiple logistic regression model was built to test the association between dental injuries and TP when controlling for cofounders, namely age and gender of study participants. The significance level was set at =0.05 (two-tailed). Results: Subjects with TP had 12.2 higher odds of dental injury (CI = 2.2-67.7, p = 0.004) compared with subjects without TP. Enamel fractures were more prevalent in the study group (p = 0.002). Frequencies of other dental injuries in the two groups were similar. GR was significantly associated with TP (p = 0.008), while differences in CAL between the groups were not statistically significant. Conclusion: Subjects with tongue piercing had more dental injuries and gingival recession.